"We're still blathering about the state of the party, not the country." "It's like the last days of Rome." "It's chaos." On the outside, the government is poised to send a letter to the European Union ahead of talks in Brussels at some point tomorrow, with the final draft likely to be completed in the morning by the prime minister and her team of advisers. The letter will spell out the kind of delay the government is seeking to the Brexit process. The delay, and the next steps in our departure, were the subject of a 90-minute discussion at cabinet this morning. But ministers and advisers on the inside have a rather different view of what's going on. The cabinet is still split, with some ministers who believe that a long delay is needed. So, as one outlined today that the "best thing for the country is for someone else to grab control of the order paper and move to a customs union" - translated, push for a long pause on Brexit so that Parliament can wrangle its way to a softer Brexit. Others, like the leader of the House, who sources say argued the case with force today, believe that the government should ask for a short delay, then ramp up to leave without a formal arrangement with the EU, having had more time to prepare. One minister who was in the room suggested the prime minister gave the impression that she would ask the EU for an extension to the end of June, with the option of (you guessed it) a "backstop" option of a delay of up to two years. But another minister said they left the meeting with the view that there had, in fact, been no judgement really made at all. Another insider was boiling with frustration that, in their view, yet again, Theresa May was failing to express what she actually wants to do clearly, and allowing the Tory Party, and of course Parliament - and more importantly the rest of the country - twist in the wind while she grinds on. There is also, as ever, a less theological group of ministers who are trying to help manage the competing factions, although some of their colleagues on the backbenches believe they are just passive passengers. Just in case you needed reminding, delaying Brexit at all goes against the promise that Mrs May made so many times. And how long for is of course a question of massive significance to the country, and also, may have a bearing on whether the government has a real chance of finally ramming its EU compromise deal through Parliament before too long. It is still possible that could happen, and when it does, happen rather fast. But the latest cabinet nightmare over the delay tests almost to destruction the notion that this administration finds it almost impossible to reach meaningful conclusions on Brexit, so profound are the divisions inside. 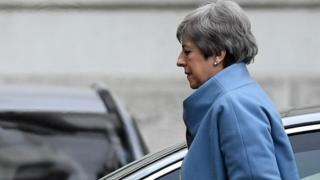 Officially, Downing Street sources denied there was any firm conclusion of timelines, although the prime minister has said on many occasions she wants it done as soon as possible and has mentioned the short "technical" extension of 30 June many times. They say there has been no final decision. For Mrs May's growing number of critics in her own government, that is exactly the point.